Hey guys! 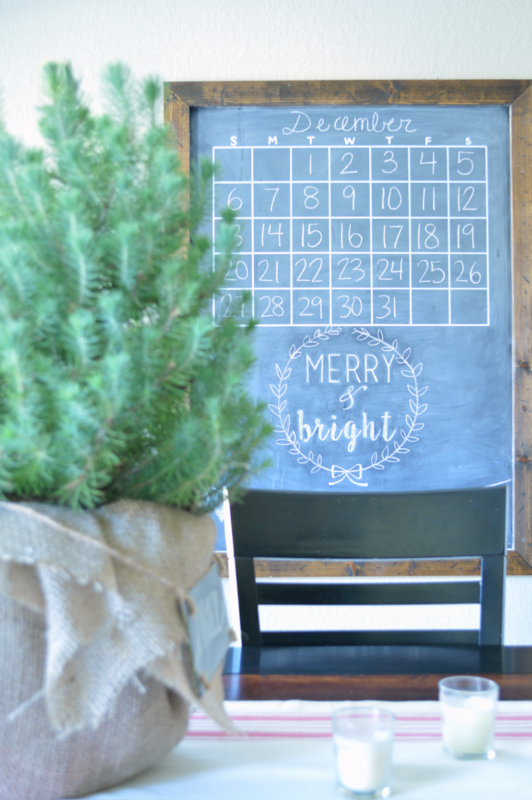 I’m back today sharing the second part of my 2015 Christmas Home Tour! 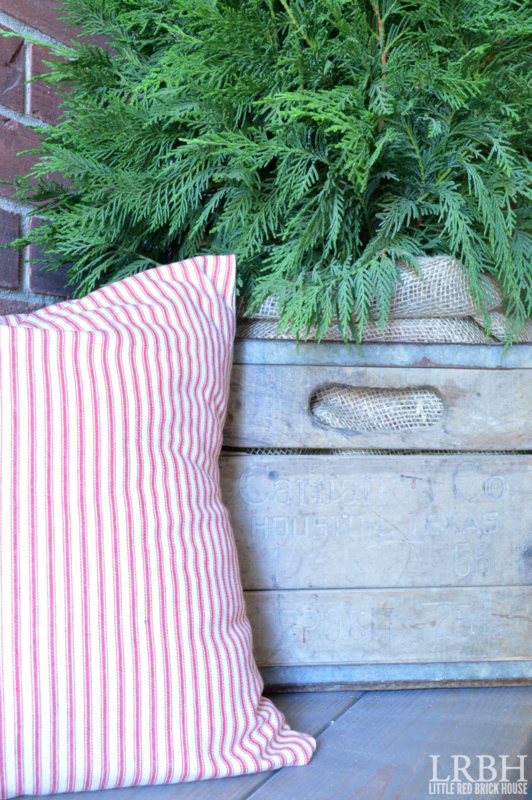 I’ve teamed up with a lovely group of ladies who all share my affinity for farmhouse style decor. 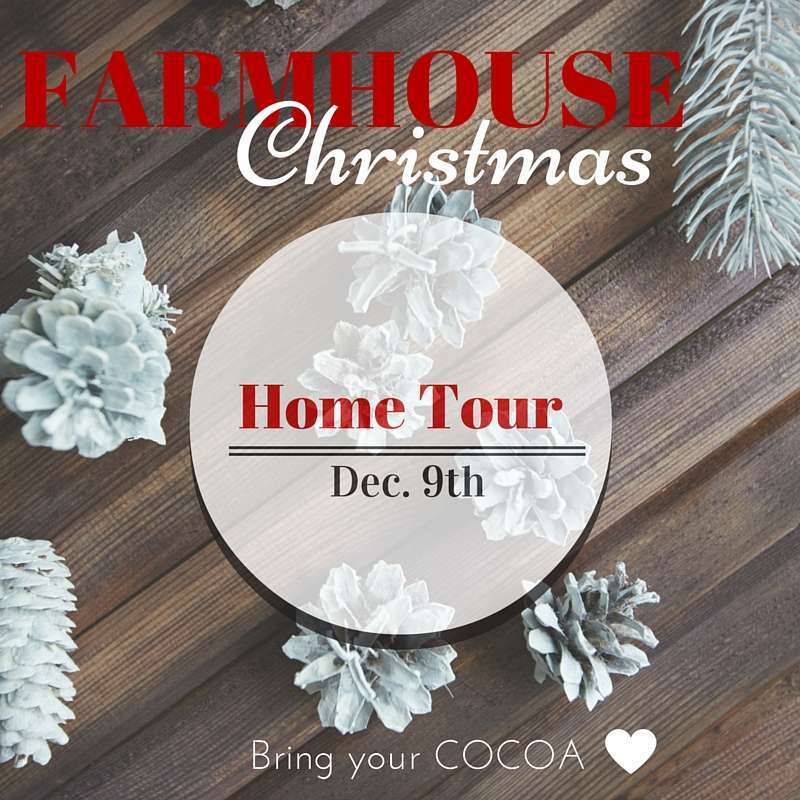 Please take a moment to browse around their tours at the end of this post. I promise you won’t be sorry! 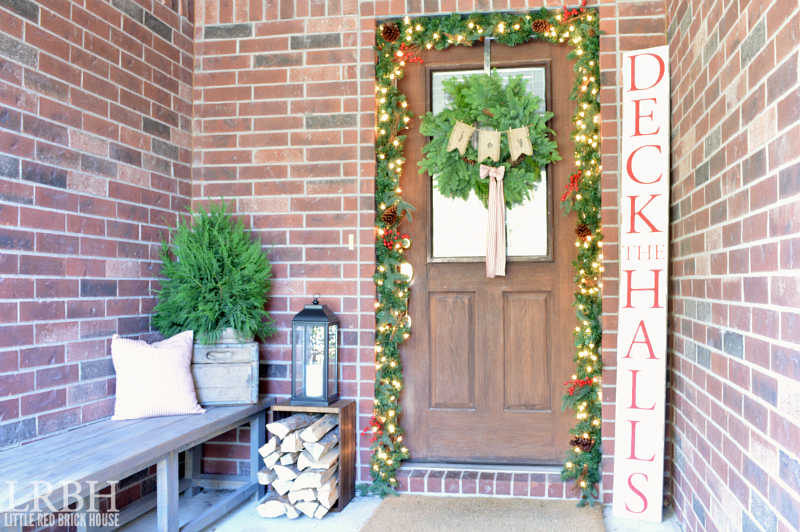 Also, if you’re interested in seeing my mudroom and living room all decked out in Christmas cheer, you can check that out on part one of my Christmas home tour. This post contains affiliate links for your convenience. Click here to read my full disclosure policy. For this tour I wanted to share my front porch and dining room decor with you. We’ll start with the entryway. I added some lighted garland around the doorway to frame the door and illuminate the space at night. I styled the wreath for this month’s Monthly DIY Challenge. 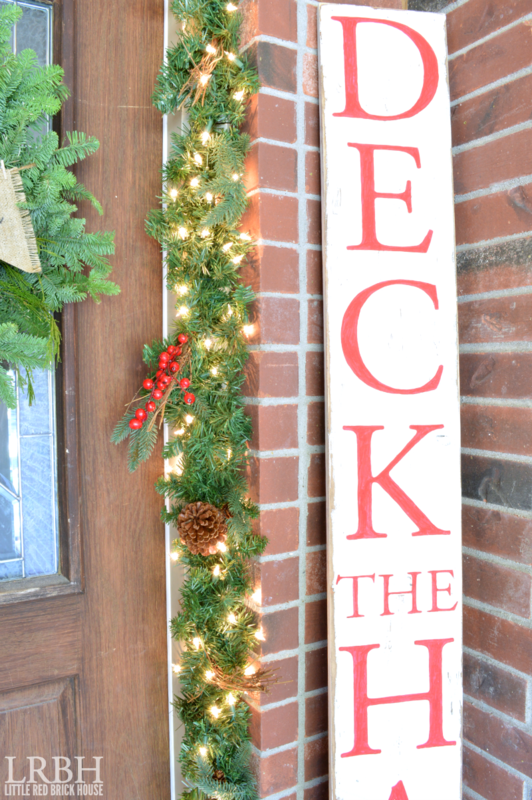 The “Deck the Halls” sign is a DIY that you can find here. I’m all about mini Christmas trees this year. They’re just so cute and fun to style. 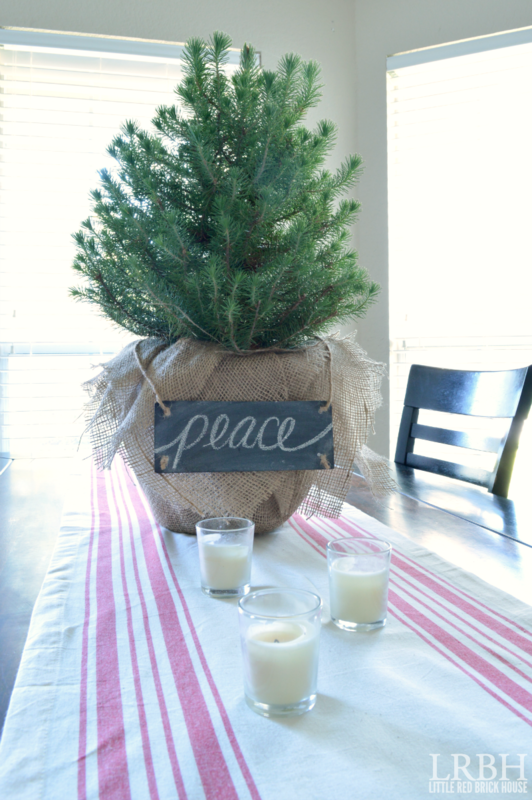 I placed the tree in a vintage Carnation Milk Co. crate from the flea market. 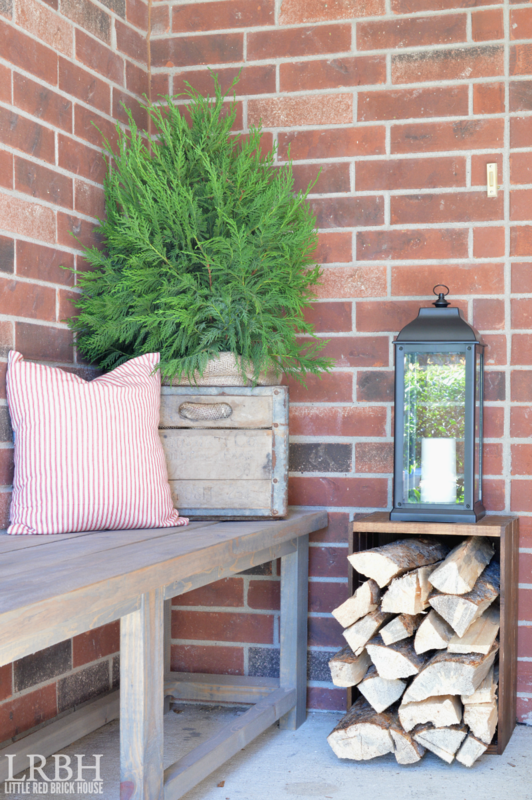 Firewood stacked on a crate makes the perfect spot to set a lantern. 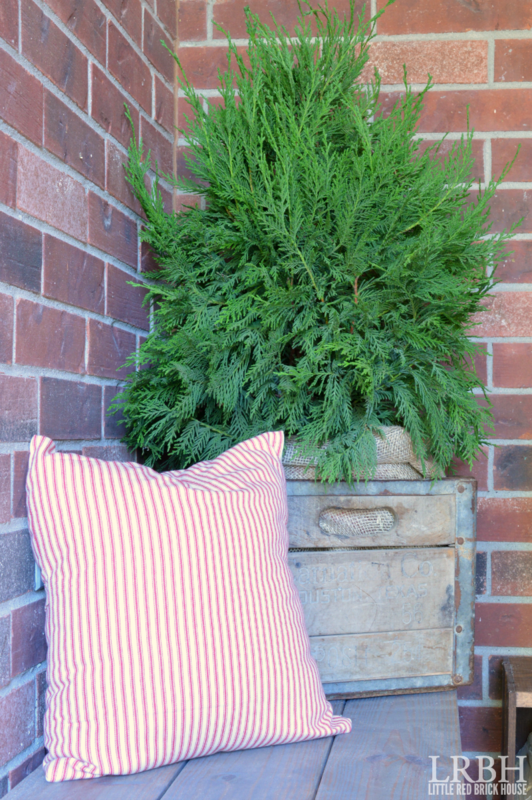 I made a slipcover for the pillow from red ticking stripe fabric. Here’s the tutorial I followed to make it. Now let’s head to the dining room! I’m craving simplicity with my decor this year, so you won’t see any elaborate tablescapes in here. I wanted to keep things fresh and opted for a simple red grain sack stripe table runner topped with a mini tree and a few votive candles. Those windows sure could use some trim or curtains, though. 😉 I’m still debating on what I want to do with them, so for now they stay bare. 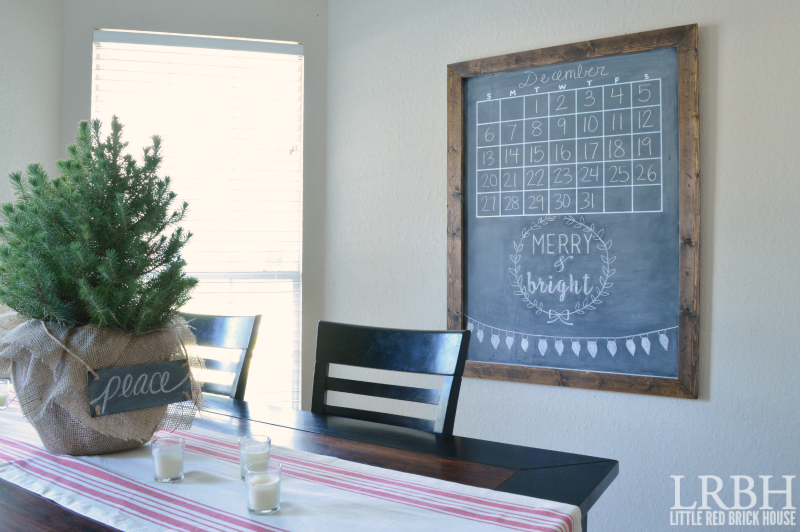 I finished off the dining room with a little festive artwork on my chalkboard calendar. 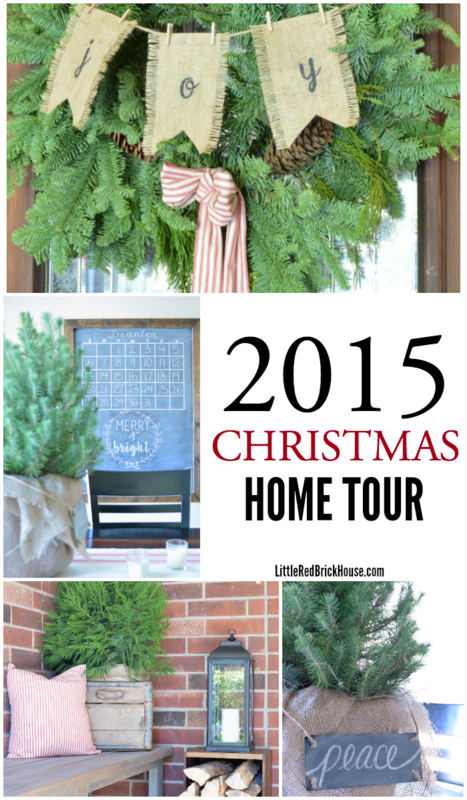 Thanks for stopping by part two of my 2015 Christmas home tour. I had so much fun decorating and sharing with you! 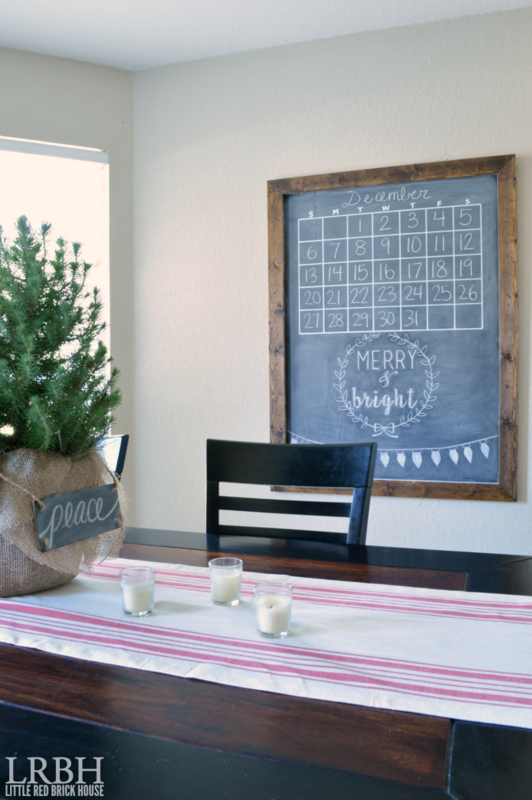 For more farmhouse Christmas inspiration, stop by the rest of the lovely home tours below. Everything is just beautiful Sarah! Your entry way is stunning. It makes me sad that I neglected mine a little this year. I hope you’re having a wonderful Christmas season! Thank you, Amanda! I really tried to keep things simple this year and not get too “themey” with the decor. I’m glad you like it. Have a wonderful Christmas season, as well! Thanks, friend! Of course, I’d love to come decorate and craft with you! 😉 You should try the printout transfer method. All you have to do is trace over it! I love love love your entryway Sarah! So welcoming and cozy!! Thank you, Leigh Anne! Wish you could come see it in person! You did an awesome job!!! It’s all so pretty and christmasy 🙂 Love your chalkboard sign! Thank you, Bre! I love Christmasy!! I LOVE your use of greenery Sarah! And that chalkboard is awesome! Thank you, Emily! The greenery really is refreshing! Lovely!! 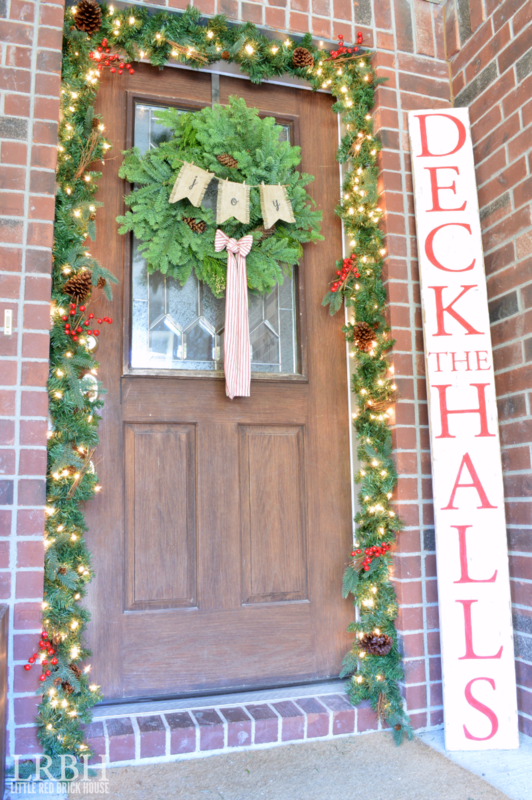 Especially Love your “Deck The Halls” sign by your front door. Everything looks beautiful. Thank you so much, Randi! I had a ton of fun decorating it all! 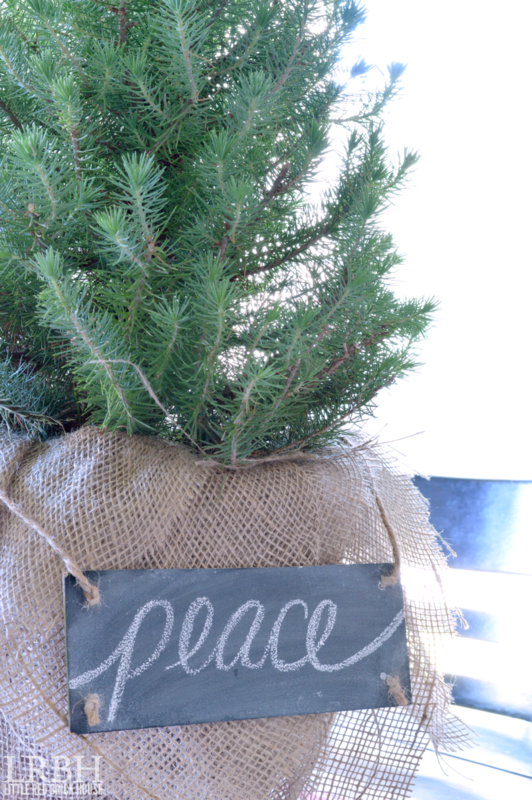 Oh, I simply love that chalk board, oh and that crate on your porch and… shall I continue? Lovely job! LOL, Laurie! Thank you so much! It was a blast to decorate. You are too sweet, Deb. Thank you! So so beautiful! I just love your home, Sarah. That chalkboard is just pure perfection! SO pretty, Sarah! I love how you decorated your front porch, too. It’s all gorgeous.